Offering anonymous check-in 24 hours a day and free valet parking, H La Paloma is a love hotel located in the Raval neighbourhood, just 200 metres from Sant Antoni Market. The modern rooms at H La Paloma feature a king-size bed, free Wi-Fi, flat-screen satellite TV and private bathroom with a hairdryer and free toiletries. Each room comes with a free private parking space. H La Paloma is 150 metres from Sant Antoni Metro Station. MACBA Modern Art Museum is 600 metres away, and La Rambla is around 1 km away. Please note that H Paloma also functions as a love hotel. Guests staying at this property share the same entrance but are divided over different levels of the property. Please note, the property does not accept guests 17 years old or younger. If you are not the owner of the credit card used to make the reservation, please contact the property in advance. Guests are required to show a photo identification and credit card upon check-in. Please note that all Special Requests are subject to availability and additional charges may apply. Please inform H La Paloma in advance of your expected arrival time. You can use the Special Requests box when booking, or contact the property directly with the contact details provided in your confirmation. This air-conditioned room features free Wi-Fi, flat-screen satellite TV and a private bathroom with a hairdryer and free toiletries. 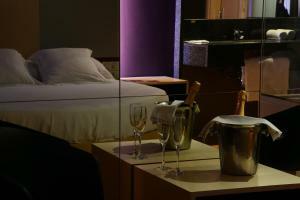 Rate: € 56.00 ... € 366.00; select dates below to get current rates. Refurbished in 2018, this room comes with a extra large round bed, a large mirror and a spa bath. A private parking is included in the room rate.